Brain Power Zoo, an animal memory game played with cards, trains attention and working memory. 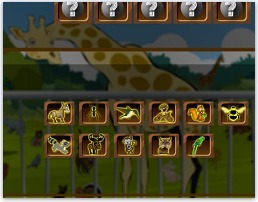 Memorize the animal cards shown at the top, then click the animal pictures at the bottom in the correct order. The cards in each sequence are only face-up for 3 seconds, which doesn't leave much time to use fancy memory techniques. I've found that the "chunking" technique seems to work best, at least for me (see below). If you like this game, you might also enjoy my Mario Memory Game and Match 'Em memory match game pages. HOW TO PLAY. It's time to test your memory! Memorize the animals' arranged order from left to right, and click on the animals in the same order without making a single mistake. If you mis-apply even one click, you lose the game. Even if you make a mistake, you can still continue from the level where you left off. Click the Try Again button on the final screen to continue. As you progress through the levels, the memory challenge gets more difficult. Whereas the first level only has two cards, by the 8th level you will need to remember sequences of 5 or 6 cards. TIP: When away from the computer, you can train your working memory by playing working memory card games like Number, Color, Suit. Your working memory can only hold eight or nine items at most. A memory trick is needed if you want to remember more items than that. After playing this game awhile, I found that the "chunking" technique is fairly effective. Chunking a sequence means to break it up into small parts, then memorize those parts separately. You've probably done this many times before without realizing it. For example, consider your telephone number. It's much easier to remember 713-419-8454 than 7134198454, which is why phone numbers are always written with hyphens (the dashes). That's because the hyphens create artificial "chunks" of three or four number that are easy to remember separately. It's much more difficult to memorize a 10-digit sequence that isn't broken up. Creating these chunks is simple. As you think of the name of each animal in your mind, pause briefly after every three animals. The pause separates the animals into the chunks, or small groups. Easy, right? As with the individual digits in a telephone number, breaking up the sequence of images in Brain Power Zoo makes each animal card sequence much easier to remember. 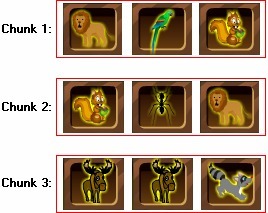 To remember the very long sequences at higher levels of the game, include more animals in each chunk. In other words, include three or four animals in each chunk rather than only two or three. In any situation where you need to remember a string of numbers or items, try the chunking technique. You will be amazed at how well it works. Animal memory game distributed by Y3.com. Used with Permission.